Fry the onion in a large non-stick saucepan until cooked and glassy. Add the lamb and cook until browned. Stir in the balti paste and coat the lamb pieces before adding the chickpeas. Cover with a lid and cook for 30 minutes on a low heat. Remove the lid, pour in the Carnation Evaporated Milk and add the stock. Simmer for about 15 minutes until the sauce thickens. Just before serving, stir through the spinach leaves. Ensure the lamb is piping hot when serving. Hello, this recipe is better suited to the stove top. 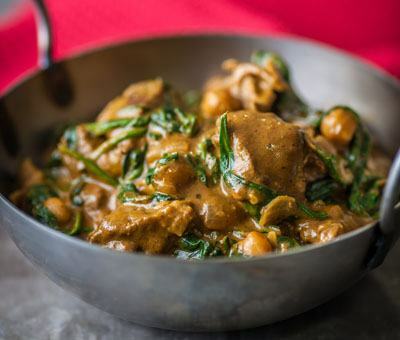 Lamb, Chickpea and Spinach Curry is rated 5.0 out of 5 by 1. Rated 5 out of 5 by Jane from Lamb Curry First time ever to make a curry and the family loved it. Really enjoying all the recipes on the website.